Called by the Edit Favorites button in the Change Coordinate System dialog, the Favorites dialog for coordinate systems allows building and editing a list of frequently used coordinate systems. Any favorites we add will appear in the pull down lists of favorites in menus to pick coordinate systems, allowing a one-click choice of a favorite. Add - Add a new favorite. Launches the Coordinate System dialog. Add Defaults - Adds factory default favorite coordinate systems to the current list. Use this to restore factory settings if any of the original default favorites have been deleted. Ctrl-click a favorite to select it or to de-select it. Invert the selection. A quick way to select none is to Ctrl-A and then Ctrl-I. Move to Top - Moves the selected entries to the top of the list. The entry must be selected for this button to be enabled. Move Up - Moves the selected entries up one position in the list. The entry must be selected for this button to be enabled. Move Down - Moves the selected entries down one position in the list. The entry must be selected for this button to be enabled. Move to Bottom - Moves the selected entries to the bottom of the list. The entry must be selected for this button to be enabled. Delete - Remove the selected entries from the list. The entry must be selected for this button to be enabled. Enabled when the lower pane contains a coordinate system. Choosing a coordinate system through other means and then launching the Favorites dialog will populate the lower pane with that coordinate system. Pressing the Add to Favorites button will add it to the Favorites list. Coordinate system dialogs called by the coordinate system picker button in the Contents pane will feature favorite coordinate systems in menus. For example, in the Change Coordinate System dialog we can click the coordinate system picker button to choose a new coordinate system. The default favorites and any other favorites we have added will appear in a list, along with an Edit Coordinate System option to launch the full Coordinate System dialog. Synonyms - Cartographers favor the term projection while programmers seem to prefer coordinate system. This documentation uses the two terms interchangeably, with the term projection tending to be used more in GIS or display contexts and the term coordinate system tending to be used more when discussing programming, SQL or standards. Example: Assign Initial Coordinate System - Use the Contents pane to manually assign an initial coordinate system when importing from a format that does not specify the coordinate system. Example: Change Projection of an Image - Use the Change Coordinate System command to change the projection of an image, raster data showing terrain elevations in a region of Florida, from Latitude / Longitude to Orthographic centered on Florida. 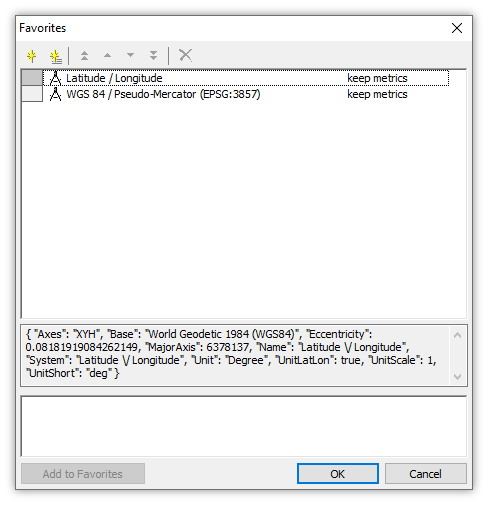 Example: Adding a Favorite Coordinate System - Step by step example showing how to add a frequently used coordinate system to the Favorites system. Example: Detecting and Correcting a Wrong Projection - A lengthy example exploring projection dialogs and a classic projection problem. We save a drawing into projected shapefiles and then show on import how a projection can be quickly and easily checked and corrected if it is wrong. Re-Projection Creates a New Image - Why changing the projection of an image creates a new image.